Med Couture is the leader in fashion-driven uniforms and scrubs for women in the healthcare industry. Founded in 1987, the Dallas-based company is a pioneer in the market. Med Couture has an active tradition of innovation as the first company to introduce fashion colors and 100% cotton fabrics in the 1990's. 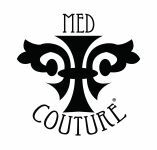 Med Couture medical apparel is sold nationwide and online at leading medical retail outlets.